Doesn’t time fly? It seems like only yesterday I was looking at the first spring flowers and anticipating the long hot summer ahead. Now here we are, approaching the middle of August, darker evenings and early morning grass wet with dew. I’ve just taken Charlie and Daisy out for a run. They run, not me. There’s a hundred metre long, forty metre wide patch of grass next to our car parking bay studded with horse chestnut, ash and field maple saplings. In twenty years’ time the ash will provide a roadside canopy forty feet high but, for now, it’s a marvellous place to exercise the dogs. Ten minutes with a ball thrower and three heavy duty unchewable rubber balls and the dogs had had enough and were very wet after sprinting and rolling in the wet grass. For the first time this summer I’ve had to towel them down before letting them into the boat. James is now dog friendly. We have durable plastic deck mats covering the front deck and a large door mat over the plastic mats in front of the front doors. The front deck is protected by a cratch cover so when the weather isn’t too pleasant, Sally and I can stand in the dry to towel down the dogs. We have oak effect laminate flooring inside the boat so even if the dogs’ paws are still wet or dirty it’s seconds work with a mop to clean up after them. Firstly, please let me apologise if you’ve subscribed to the newsletter list within the last week. 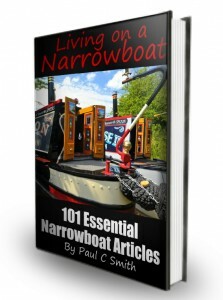 You may have done so as a result of my offer of a free eBook, Living On A Narrowboat: 101 Essential Narrowboat Articles. If you did, you may be wondering where it is. I have a confession to make. Technology has beaten me again. You should have received an email containing the download link. It wasn’t working properly but I think I’ve beaten the gremlins now. This time you should be OK. If you’ve been visiting the site regularly, you will have read much of the information contained in this latest guide. It’s a distillation of the thousands of hours I’ve spent over the last three years researching content, writing content and developing the site. I’ve included all of the articles from the site, links to all of the popular forum posts and an index of all the regular newsletters since I began sending them out in January 2011. It’s a bit rough around the edges at the moment. I need to spend a few hours formatting the guide and generally tidying it up. Because the guide isn’t quite as polished as I would like it to be, it’s yours completely free of charge. There may be a cost in the future once I’ve spent some more time on it but, for now, it’s yours to download at the click of a button. Click here to download the guide. You’ll need to add your email address to the form in order to receive the download link. If you use the email address this newsletter is sent to, you will only receive an email from me telling you how to download the guide. If you use a different email address, you’ll also receive an email asking you to confirm your subscription. If you click on the link in the confirmation email, you’ll be added to the newsletter list again and you’ll receive two copies of the newsletter every Sunday. Much as I want you to receive my regular newsletters, I don’t think there’s any point in you getting it twice so, if you’re already a subscriber, please ignore the confirmation email. Do You Know Anyone Else Interested In Narrowboats? There’s a huge amount of information in the guide. At over 53,000 words it’s as long as your average paperback but, not only is the guide packed with helpful articles, but it also links to hundreds of other site articles and forum posts. 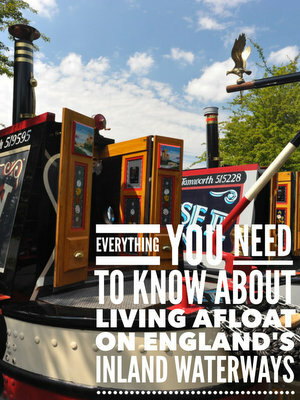 It’s a wonderful – and free – initiation into all things narrowboat. If you know anyone else who might find the guide and the information it contains of some use, please forward this email to them. They’ll thank you for it, and so will I. Buy yourself a recovery magnet. It will pay for itself in no time at all. I have a pocket sized Maxigrab magnet which I attach to a very useful 100m reel of parachute cord I keep in the engine room. I the last six months I’ve used it to recover a padlock, two shackles, a mooring pin (pulled out by a fast passing boat) and a coal shovel (twice) we use as a poop scoop. The magnet is work its weight in cold, and it’s fun to use too. Getting rid of troublesome geese. Canada geese are a nuisance. They’re dirty, extremely noisy and there are millions of them in the UK. Their constant annoying honking can easily ruin a good night’s sleep. I’ve tried many different tactics to get rid of them both from the marina – we had two hundred land a couple of years ago – and from near my own mooring. By far the most effective method is the none harmful use of a laser pen. Mine is a military grade green laser. It came with a rechargeable battery and charger. I haven’t had to use the charger yet. The battery has lasted eighteen months so far. It’s easy to use and is effective within seconds. Just shine it on the annoying geese at night, wait for the panicky mass honk, furious flapping and the delightful sound of them flying away to bother someone else. It’s magic. Make sure your boat has a centre line. It’s arguably the most important rope on the boat buy I constantly see boats cruising without them. A centre rope is essential if you’re going to cruise single handed, but it’s also a very important item of boating equipment if you have a full crew. I see no end of inexperienced crews trying to hold a boat to the bank with a bow or a stern line at locks, and then trying to retrieve the end of the boat which they aren’t holding when it drifts out into the canal. I’m going to have to stop there. I’ve run out of time but I can think of dozens of other useful tips. If you’re a boat owner I’m sure you can think of dozens more. Why don’t you share your knowledge with the site’s soon-to-be boat owners? You can either email me the tips so I can add them to the site for you or post them on the forum here. I wrote about this forum thread last week but since then forum user and continuous cruiser Bikeshed has added some fascinating information. He explains how it’s possible to live a stress free life on his narrowboat on an income of £96 a week. His expenditure may not suit everyone but he demonstrates that a very low cost lifestyle is possible Here’s the forum thread. I’m sorry it’s such a short newsletter this week. I’ve spent most of my time finishing off the new guide, uploading it to the server and creating the download section. There’s more than enough information in the guide to keep you going though. You can download it here.